But did at one point have a choice. But can you guess what I am? GENEPOOL (I think I made it a bit obvious with the title, and the image). I love cars. Cars are one of my big interests in my life along with other interests such as Writing, Films, Godzilla, Board Games, Cooking, Music, TV, Video Games, Technology, Trains, Dinosaurs, and Buildings. OK, so I do have a lot of other interests too that include but are not limited to the things I have just mentioned. But, I genuinely like cars. Yes, it’s been tough since the loss of Top Gear, but as a car fan I have still managed to keep up my love for the things. I may not be able to drive (yet), but I always have a keen eye out for cars when I see them out on the street (and wish I had my camera with me). I even have my fantasy car collection that includes cars produced by companies such as Lamborghini, Pagani and Jaguar (cars which I hope to drive one day providing I can get somewhere with my writing career). So with a love of Cars and Movie’s, you may think that I must love it when the two come together? Well Cars and Video Games yes, Cars and Movies though is something I have not tried until I saw Love The Beast. Released in 2009 and Directed by Eric Bana; Love The Beast is a documentary-film (or docu-film if you prefer) about the love affair Hollywood star Eric Bana has for his first car; a Ford XB Falcon Hardtop, which he’s named ‘The Beast’. My own personal knowledge of this film ends before I saw it. I first heard about it on an episode of Top Gear where Eric Bana was the Star in the Reasonably Priced Car. After that I did not really look into it. But then, after I started working in Barnardo’s; I found a copy of it on the shelves. After a few months passed, I finally got it out of curiosity and thought I would give it a go; which I did. Love the Beast begins with Eric Bana talking about his youth, and especially about watching Australian Motor Racing. He remembers seeing something taking place at the Bathurst motor race involving a couple of Ford Falcon’s. From that moment on he was in love with that kind of car. So much so that when he was about 15, he persuaded his Dad to buy one for him. Over the next several years, Bana and his friends work long periods to bring the car back to its original glory. Eventually, Bana and his friends enter the Falcon into the Targa Tasmania: a motor race that funnily enough happened to take place in Tasmania. Hoping to enter every year from his first appearance in 1996, fate gets the better of Bana and he becomes an international Hollywood star. 11 Years after his first Targa, Bana decides to enter his Falcon into the 2007 race, after rebuilding his Falcon yet again. He enters with some childhood friends, one of them being his navigator. At first they struggle with the newly built vehicle, but soon they manage to pick up the pace. Things eventually lead to tragedy however, as on the 4th race of the 5 day event, they crash into a tree. Though a little shaken up, Bana has to leave the race and get back to his day job, by attending a New York movie premier and appearing on The Tonight Show With Jay Leno. Upon returning to Australia, he gets to have a proper look at his badly damaged vehicle. From then on it becomes a question as where to go with it next, eventually ending with him covering it up in a sheet in his garage. The film then ends with the suggestion that he will one day return to it and fix it again. Love the Beast is a film I find hard to really review, this could be though do it being a Documentary film rather than a fictional piece of work, a genre I have only done one other film review before. I suppose, a great place to start would be to talk about what it is. Love The Beast is a film about cars, a documentary about cars specifically. It is a film about a man’s desire to enter a car he loves into a motor race. Now if this was an ordinary man no-one had ever heard of before, it would be a different story. In this instance however it is actor Eric Bana whose movie output includes the film’s Troy and Hulk. In this case it is quite different, as it becomes a film not where he is playing a character, but more one where he is talking about his social and personal life. From the outset, the film talks about his growing up and what part of his young life the car meant to him. The film then goes in the various directions a documentary would go to cover all of its bases. It goes into talking about the Targa Tasmania, the Falcon and its appearance in the original Mad Max; it then goes into talking about Bana’s father’s love affair with his own Ford Thunderbolt. Then in the background of the film, there is a host of interviews of Car Enthusiasts and celebrities including Jeremy Clarkson, Jay Leno and Dr. Phil McGraw. It then talks about the Targa in more detail and includes the style of cars used in the race series and the difference between new super cars, and old muscle classics. It is a film that is definitely about cars and man’s love affair with them. Not in the form of them as tools driven by people who consider them nothing more as tins on wheels, but as symbols that mean something to people growing up and how they become a metaphorical camp fire for people now grown up and how they still need these symbols in order to be themselves. That is what the film is trying to present, well aims to achieve, because on the whole it has a lot of issues. Love The Beast has narration off-screen frequently throughout, but from the start this comes with a level of near boredom. Bana himself I felt is not all that good a narrator, or at least not yet. As he spoke from the beginning away from the camera, it was like he was reading from a pre-prepared script written by someone else. It was not like he was telling a story, nor like he was informing the audience about his past experience. When he is in front of the camera, being in the scene and talking normally/casually with everyone else, his soul and passion for what he loves comes out to the full, but as a voice over it is not really all that believable and can be pretty boring. Bana presents himself as a more straight-up kind of guy; but the way he narrates this neither suggests nor promotes his love and interest for his car. When I first started to watch this film I was constantly near blacking out, like there was not much going on. I like cars, love them in fact. Before lasts years consequences ended it for good; Top Gear was my Favourite show. My Favourite car for many years now has been the Pagani Zonda F. I like cars, but this, a film about cars, is something I am finding hard to like in the least bit. It’s a real case of the Marmite belief. Marmite, some kind of ingredient/spread that you can do edible stuff with has always had the moniker of either you love it or hate it. Well, Love The Beast is something like that, and I myself am not too sure on where I personally stand with it. As a film, it’s more of an informative piece. Something you would watch on an afternoon if there was nothing good on tele, not on a Friday or Saturday evening. But then, when you reach the 40/50 minutes in marker everything changes. It goes from a half attempted documentary on entering a racing series to an understanding of what this car means to Bana. It’s a different yet interesting point of view of a well-known person in the public light. Instead of gossiping on every element of his personal life with subjects like food, weight, clothes, relationships and all the other garbage gossip; Love The Beast becomes a deep and moving insight into a true passion of his, his car. Up till now it has been a basic documentary with nothing much really to focus on. No theme for the documentary to follow or look into specifically, but then as it finally begins to gain pace, we discover that for Bana, the car is less a tin on wheels tool/contraption for the masses; but an icon of his youth and an important part of his history. It provides him with personal drive (pun not intended). This passion ultimately leads however to tragedy, as while everything was going well at first; in a heartbeat it ends in a collision which brings the star to a halt as fast as the crash itself. At first I thought this sounded like it was planned, but to this though comes the films real story and eventual meaning. The film, the events, the interviews; it’s not about Bana learning about the car or its place in automotive history, nor is it about a man entering a race in the hope of achieving sporting glory. You realise that all along from the beginning, that what it’s all really been about is this titan of Hollywood coming to terms with the crash and the damage sustained to his beloved Ford XB Falcon Hardtop. Something that is more of a childhood friend severely injured/disfigured rather than it simply being a gash to a tin with wheels on it. From the moment he sees it in proper in a garage, it changes him, and he goes and talks to the celebrities to talk to them and ask them for some form of guidance or hoping that they may shed light on what has happened and why it has happened. For Bana, it’s less a documentary or film, it’s actually therapy. This is the moment where the film goes from its original aim to a personal struggle. This is true reality and one that is felt deeply. Love The Beast’s true meaning therefore is one of how much symbols and icon’s mean to us personally in our lives from a young age and how these things can hurt when they take a hit…..no matter how old we are. Ok, I can see I may have gone off track (pun not intended again) with this film as a whole, but in effect, that’s what this film is about, one man’s passion for his car and what it means to him. Now that is not to say the film did not have its issues, but from these issues comes a film (in a similar style to the BMW M5 review on Top Gear) that provides something different. I like documentary films. I really do, and while this one did struggle to begin with from this mediocre/weak start; it became a really passionate story. Add to this the inclusion of top car personalities like Clarkson in particular, and you get this really interesting creation. Yes, there are better things to watch on a Friday and Saturday night slumped in front of the TV, but if you love cars as much as me, and carry a passion for the true monsters of automotive design and engineering; then you will want to see this film. Last week, I took my first step into doing something I have always wanted to do, but so far as yet had not. I had my first sitting behind the wheel of a car. For the past several weeks, I have been trudging around several employment websites looking for work, and am as yet unsuccessful in finding something. When I do find something promising, or that I like the look of, I will read about it and if still interested would apply for it. One issue that I have found is that many jobs ask for a current driving licence. Not too big a thing unless you don’t have one, and need the income to learn to drive in the first place. Well, a few weeks ago I started looking into Intensive Driving courses in the hope I could learn quickly and receive a driving licence as quickly as possible to allow me to apply for those kinds of jobs with ease. A couple of weeks later, my Mam informs me that a friend of hers at work, knows some people who offer driving experiences to allow the people the option to just have a little driving lesson and see how they feel. The experience is only really offered to 14-16 year olds, not people over the age of 20. However, I was able to get a slot to have a little go behind the wheel of a car. I was booked in, and went to the Truck Haven near Carnforth last week where a section of car park was roped off. I was rather scared and worried as I had no idea how the car was going to react, or if I was going to like it or not. I had little worries going through my head. I met my instructor there and he had me take a seat in the front of the car behind the wheel. Getting in was hard due to my height, but he took me through the basics, such as pushing the seat back, heightening and lowering the back rest, adjusting the mirrors, the order of pedals including which foot to use best for which pedal, everything to the point of turning the car on for the first time. He then instructed me about the ‘biting point’ and how to start the car up into it moving for the first time. To begin with it was only in first gear, and I only drove round the area once before coming to a stop. But I really enjoyed it; it felt so amazing to drive the car round. We then did it again, I was a bit harder on the brakes that time, but I was beginning to enjoy it more. And it didn’t stop there. He took me through braking for a corner (something I was worried about given my experience in Test Drive Unlimited 2) and how to change-up and down a gear. I really did enjoy it, and felt a little bit sad when my slot time was up. I had a brief talk with the instructor and my Mam, and the hope now is that I will be proceeding with learning how to drive. I am still a little scared to be going out on the road with real drivers to learn, but I am kind of excited to finally learn how to drive a car. Then all I will need to do is get a job to pay for my own once I pass my driving test. GENEPOOL (I very much doubt that my first car will be a Pagani Huayra). It is no big secret that I like cars, I like all sorts of cars but my Favorite genre/type of cars are Super Cars. While I do like Big Four by Fours as well as classic cars and even some family type cars, I do prefer supercars to most other types. If I was to give you a list of my top 5/top 10 Favourite cars it would be highly likely that most of the list will be filled with Supercars. But more recently I have been ignoring one car in particular. A car that if you were to look at it you would think I would like it, but to me it has been causing some irritating headaches. This is the car in question, the Pagani Huayra (Don’t ask me how to pronounce to it). I have known about the existence of this car for a few years. When it was first announced I looked around for some pictures of it with no luck. Every so often I would try and look it up. But most of the time I did not want to think about it. It was not until a recent episode of Top Gear that I gave it a proper look. And I liked what I saw; it has a Good shape and gives out a lot of Power and noise, all key components of a Supercar. It also had lots of nice extras including the interesting Gear Stick. However, even after the impressive demonstration and Lap Time to me, it is still a bit irritating. Why? Well, this is why? This is the Pagani Zonda. Produced by the same company that builds the Huayra, launched in 2000, the Zonda has had various different versions over the years including the C12, R, S, Cinque, Tricolore and F. The Zonda (Zonda F to be exact) is also my Favourite Car. The first time I saw it was on an episode of Top Gear (The Milau Bridge Episode, one of the Best Episodes), but it was not until the F made an appearance that it became my Favourite Car, and has been that way since. It’s body shape, it’s style, it’s noise and it’s speed alone make it a Fantastic Car, but to me the thing that makes it the best is that it is the true definition of a Supercar. It’s futuristic as well as mad, its name too, ZONDA, what a Fantastic name for a car. Supercars are dream cars for many and the Zonda represents this spectacularly as being a car that once existed in the minds of motoring fans, almost an impossibility before arriving on the scene and not just being a one-off car, it became a Legend of Motoring. So why would I be ignoring a car that is being promoted as the Successor to the Zonda. Well that’s it; I don’t want the Zonda to disappear. The Zonda is an incredible car and as far as I can see it cannot be replaced and should not be replaced. Sure, the company needs to progress and build new cars to continue, but why not make the Zonda alongside the Huayra. While the Zonda and the Huayra share similar looks and in that sense you could say that they are basically the same car, I still prefer the Zonda to the Huayra The time leading up to the end of the Zonda was sad for me. While it did went out on a bang with the R and Tricolore, it was still the end of my Favourite car. It may be the end of the Zonda as the main car produced by Pagani but I do not think of this as the real end of the Zonda. I am sure Pagani have their plans for the car that made them what they are, but for now the Huayra is their main project. So perhaps that is what is meant as the successor to the Zonda, it is the new Project as the Zonda is now complete. The Mustang is one of the great motoring icons. 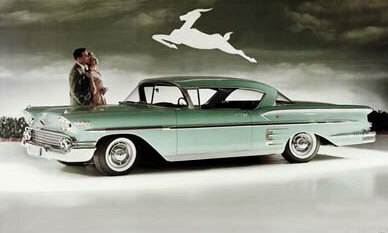 Since 1965 it has been the rebel and a car specially designed for individuality and appealed to the young people. Without it the car industry in America in particular would be boring. There would be no Camaro, no Charger and possibly No Muscle Cars at all. However all legends must start somewhere and the Mustang’s began with a completely different car built in the late 50’s. When there was a call for personalization, many cars began to appear to appeal to this market. The idea of individuality appealed to younger drivers in particular who wanted independence from their parents and what they drove. A stylish car was needed to appeal to them, so that’s what Ford did. In the late 50’s Ford released the Edsel which was a massive failure. TIME (2008) states “the car was kind of homely, fuel thirsty and too expensive, particularly at the outset of the late ’50s recession. But what else? It was the first victim of Madison Avenue hyper-hype. Ford’s marketing mavens had led the public to expect some plutonium-powered, pancake-making wondercar” It was released just as consumer preferences changed. The Edsel was aimed at the personalization market but at the wrong time. When the idea was conceived that would have been the time to release it, but when it came out it was too late. Due to the late release of the car, Ford lost millions of dollars in production and manufacturing costs. The car itself came out at the same time as the Impala which has a similar design to it. They both long extended back ends and have a stylish appearance designed to appeal to young people of the decade, but the decade was ending and so if The Edsel was released earlier it may have had more success, but bizarrely the Impala was a success. Well if we had a further look at the Edsel, the grill is a bit off-putting and does make the car a bit ugly while the Impala’s front end looks more like an ordinary car. It is clear to see that the Edsel was an unlucky car, but from this failure came success in the form of The Mustang. It is important to remember the Edsel when you think of the Mustang because if the Edsel was a success the Mustang may not have happened. The Mustang also helped to get back at Chevrolet for the Impala, because the Mustang was far more successful than the Camaro. So while there was a failure, from this failure came success and while this success has become an automotive legend it is important to remember that legends don’t just appear, they have to start somewhere, even if it is a bit odd.